What Technology Features do you get With the Ford EcoSport? If you are looking for a new compact SUV, the Ford EcoSport may be an ideal match. 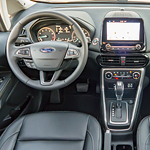 At Wynne Ford in Hampton, the EcoSport is a popular model because it comes with an abundance of technology features. Let's take a look at a few technology features that come with the Ford EcoSport. The EcoSport offers satellite radio. You can take advantage of SiriusXM Satellite Radio with a free trial for six months. SiriusXM Satellite Radio offers more than 150 channels of music, sports, news, comedy, entertainment, and more. If you choose the available Navigation System, then you also get a five-year subscription to SiriusXM Traffic and Travel Link. With the EcoSport, you also get FordPass Connect. This feature comes with a 4G LTE Wi-Fi hotspot. FordPass Connect lets you check fuel levels, remotely lock and unlock the vehicle, set up maintenance services, locate your vehicle, get roadside assistance, and more.